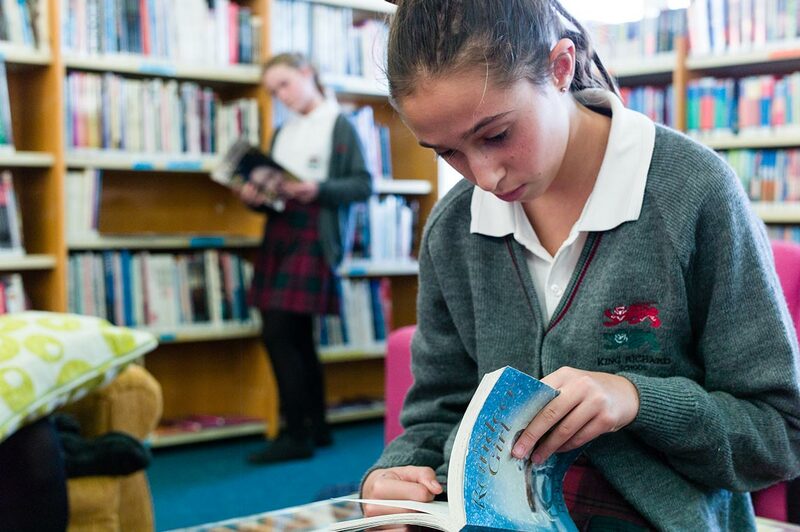 During Y7 pupils will read a variety of poetry, prose, and drama texts by a range of modern and classic writers including Shakespeare and 19th Century prose authors. They will be taught a range of skills, including how to break down a text; how to analyse the impact of a writer’s word choices and how to create their own creative and analytical texts. These skills will be through half-termly assessments in reading; writing, speaking and listening (now called Spoken Language in the National Curriculum of England and Wales). In this term, students will undertake an induction unit to introduce them to English (literacy) at secondary level. It also gives us an opportunity to assess where they are at, and how we can adapt our curriculum to meet their individual needs. The induction unit covers reading, writing and group-work skills. This is followed in the second half of the term by in-depth study of a prose text, introducing the skills of inference and deduction, unpicking the language effects, and exploring how texts are put together to achieve different effects (structure). This will lead up to analysis and evaluation. These are key reading skills; equipping students for more advanced responses to texts. Homework: Year 7 pupils are set a piece of homework every week. Most tasks will relate closely to the units studied each half term although some may be stand-alone tasks tailored to the needs of each particular group. Students will undertake a mystery writing unit to broaden and deepen their writing skills. They will write in a range of genres and styles (both fiction and non-fiction) and be assessed on how they structure their writing for effect. This will be followed by a unit of poetry and Shakespeare: exploring drama opportunities and the way that texts are put together to communicate interesting and varied ideas. This unit will allow for an appreciation of the Literary cannon, and will help introduce them to the literature components of the GCSE. Year 8 English is structured thematically: beginning with Chaucer (and his tales in Old English); then through to myths and legends (classic and modern); moving through to a class novel (usually Lord of the Flies or Holes) culminating in a linguistic study of accent and dialect. A study of language – grammar, development, influence and reception – underpins the whole year. Pupils will start this term by studying a sample of portraits and tales (in modern translation) from Chaucer’s The Canterbury Tales. This will be followed by the study of a range of autobiographical writing in both poetry and prose. These texts will serve as models for the pupils’ own autobiographical writing. Their prose piece will form the basis for this term’s assessment.A combination of: Greek and Roman myths, Greek theatre (tragedy and comedy); moving through to ballads (such as The Lady of Shallot) and or Beowulf, St George and the Dragon; finishing with modern adaptations of classic fairy tales and urban myths and legends, this unit is designed to balance classic and modern texts side-by-side; using fiction and non-fiction texts as both stimulus for writing in different genres (such as journalism) and analysing a range of text types. Students will begin this term with an in-depth study of a prose text, building on the key skills developed in Year 7: inference and deduction, analysis and evaluation. These are key reading skills. Students will learn to prepare an extended response to a creative text, and to write in the style of the chosen author. Homework: Year 8 pupils are set a piece of homework every week. Most tasks will relate closely to the units studied each half term although some may be stand-alone tasks tailored to the needs of each particular group. ‘An exploration of my idiolect.’ A linguistic study of influences on language and dialect, including poetry that explores voice (poetry from different cultures) and regional diversity. Year 9 begins with a demanding, challenging but fun few weeks exploring the popularity of TED Talks and students create their own. In lessons, students are how to apply effective rhetorical devices to their speeches; as well as practise public speaking techniques. This is in preparation for the island-wide Toastmasters public speaking competition. The first heat will be held at KRS in November.Students will then explore a demanding and engaging prose text such as The Hunger Games or Of Mice and Men. This will allow them to develop more sophisticated analysis and discussion skills in preparation for the GCSE year. The Dystopian Worlds unit (The Hunger Games or Maggot Moon) requires that students read widely: texts range from Orwell’s 1984, Golding’s Lord of the Flies, through to latest Carnegie winners and nominees Gardner’s Maggot Moon and Ness’ More Than This. This enables students to place literature in context, as well as practise the key skills of comparison and critique; presenting detailed discussions of language and structural features. To ensure students continue to mature in their writing, the term will culminate in a writing assessment drawing on all the writers’ techniques we have analysed. Homework: A research project on the concept of dystopias and how they are presented, plus wider reading from a range of classic and modern texts. In the second, students will study a Shakespeare text alongside poetry which matches the themes and ideas explored in the play. This gives them a solid grounding in key aspects of the GCSE examinations. Texts typically studied are The Tempest or Macbeth: the choice will be made on the interests and abilities of the class. Complementary poetry can include the themes of love, conflict and identity, depending on the choice of play. Analysis, comparison and evaluation skills (which underpin both GCSE Language and Literature) will be explicitly taught and developed. In the final half-term, students will study a Shakespeare text alongside poetry which matches the themes and ideas explored in the play. This gives them a solid grounding in key aspects of the GCSE examinations. Complementary poetry can include the themes of love, conflict and identity, depending on the choice of play. Homework: Year 9 pupils are set piece of homework every week. Most tasks will relate closely to the units studied each half term although some may be stand-alone tasks tailored to the needs of each particular group. The final part of Year 9 continues to build on the skills developed across the key stage. This unit explores the influence of the gothic on culture and society, with a particular emphasis on nineteenth-century literature: drawing on a collection of classic texts such as Dracula, Frankenstein, Wuthering Heights; and writers including Edgar Allen Poe and Arthur Conan Doyle. Class readers include The Woman in Black and Sally Gardner’s Tinder. This unit provides a grounding for the GCSE literature exam, as well as GCSE English Language paper 2 which uses nineteenth-century non-fiction extracts as its base. Pupils will complete a closed book response to a GCSE examination style question which will form the basis of the second half term. Homework: Wider reading of a range of short stories from the 19th century. Please note that the current Year 10 are undertaking the first year of the new GCSE: alphabetic grades are no longer used for English, students will be awarded a number from 1-9 at the end of the course, with 9 being the highest grade achievable (equivalent to an A*). We deliver a ‘Taster Unit’ introducing students to the structure of the exam-only GCSE course, focussing specifically on the reading and writing skills required in Paper 1 of the English Language exam paper. This is followed by an in-depth study of the first literature prose text: The Strange Case of Dr Jekyll and Mr Hyde. Students will need to know this text thoroughly for the Year 11 exam. In this term, students will complete a module in advanced writing skills to help prepare them for the two English Language papers: sentence and paragraph structures, figurative and rhetorical techniques. This will be underpinned with spelling, grammar and punctuation revision to ensure students achieve their full potential. This will be complemented by practising comparison and evaluation skills: applying them to non-fiction texts in preparation for English Language Paper 2. During this term, students will consolidate their study of the Power and Conflict poetry cluster (English Literature Paper 2) so by the end of Year 10 they will have studied 4-6 poems from the cluster. Students will study a Shakespeare play. This year (2017-2018) will be Romeo and Juliet. This is one of the set texts in the literature exams. As the exam questions are extract-based, students must be prepared to respond to any passage from the play: this requires regular application of analysis skills and an excellent working knowledge of the themes and ideas in the text. After half-term, the skill focus is making comparisons between texts. English Language exam skills: preparing students for the reading and writing sections of the exam papers – analysing fiction (paper 1) and non-fiction (paper 2) in the first sections of each exam paper; also writing creatively (paper 1) and discursively (paper 2). A mock for Paper 2 (non-fiction) in English Language and revision for the 19th century text and Shakespeare (Dr Jekyll and Mr Hyde and Romeo and Juliet) will take students up to the Christmas holidays. Throughout the school year, students will prepare for the literature poetry exam on ‘Poetry Fridays’: covering a selection of modern and established poetry exploring the interrelated themes of power and conflict; building on the foundation from Year 10. Students will study a modern text: either An Inspector Calls or Lord of the Flies. This is the final text that students will study for the literature exams. Waiting until the penultimate term means the test is fresh in their minds for the upcoming exams. They need to be prepared to answer questions on the themes, ideas, language and structural effects. For more able students: identifying and commenting on patterns in the presentation (motifs, contrasts etc.) are key skills for this term. As above, Poetry Fridays will continue in this term. Exam revision and preparation for all four exams. Homework will focus on consolidation and revision of key skills and texts. AS and A2 level English builds on the analysis and argument skills of GCSE: giving students the breadth and depth of a range of world and classical literatures. English Literature is a well-respected traditional academic and, as such, is seen as a desirable qualification for progression to university and within most careers: after all, communication is key in every walk of life. At AS Level, we study a range of texts within the tragedy genre at Year 12, including Shakespeare, modern texts and American writing: drama, prose and poetry are all covered in depth. Further, an extensive wider reading component ensures students have a good grasp of literary tradition. Students are entered for two exam papers at the end of the Year 12 (which can complete the AS qualification if desired). Year 13 (A2 Level) builds on the skills developed in Year 12. Students can choose to study crime writing or political writing for their examined topics: three texts within the chosen genre are studied in depth, leading to two examination papers. Students then have more freedom to pursue independent study and texts of their choice in the coursework component, which is supervised by the teacher in negotiation with the student’s own interests. Finally, unseen extracts are used in the examination to test a student’s analysis, evaluation and inference skills.